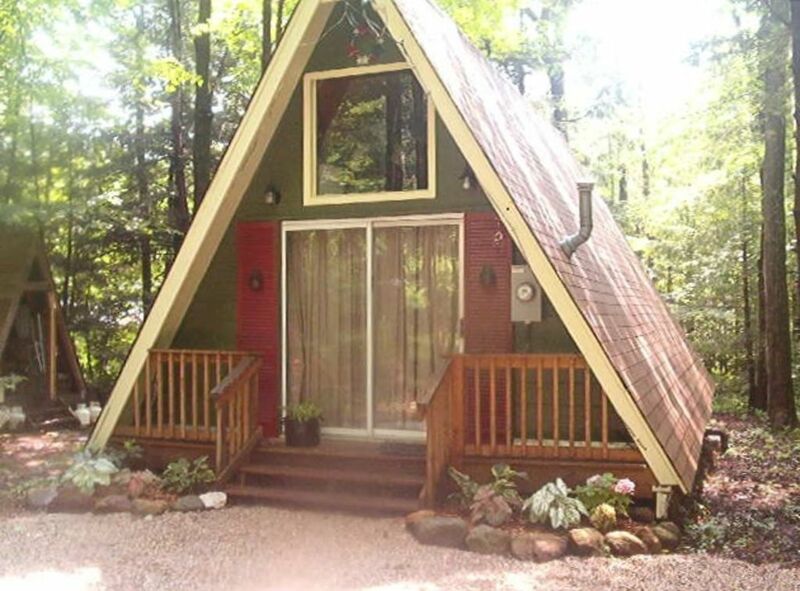 Come experience this gem of an A-frame. Situated on 1/2 acre wooded lot with no immediate neighbors on 3 sides. You can easily walk to a peaceful lake where you can enjoy swimming, fishing, or just relaxing on the beach. Relax by a roaring a fire at night under the stars at the firepit (wood supplied). Sherwood Forest is the ultimate getaway for peace and tranquility. The roads are still dirt, with a country store which will bring you back in time. Come, be a part of the Forest. Full Bath, towels provided. One bedroom on main level with a queen bed. Loft has queen bed and twin bed. Kitchen does not have stove/oven but there is a crock pot, microwave, cuisinart gourmet griddler and toaster oven, plus a large BBQ grill on back deck for all your cooking needs. We stayed for 3 days and absolutely loved it. This area is so quiet and peaceful.You really don’t need to bring anything but food and clothing and everything else you find it there. Great little kitchen equipped with all your needs, plenty of pots , plates, cups.We really didn’t miss not having cable, movie selection is awesome. It’s really clean and comfy. If you looking for a quiet, relaxing getaway, look no further!! The owner make sure you have plenty of everything and more, communication is great with her and our sec.deposit returned quickly. Glad you enjoyed your visit. Hope to see you back in the future. The A Frame was amazing, our second stay, and will definily return! Thank you Donna for sharing your home with us. It was adorable and just what we needed! Disconnection and reconnection! So glad you enjoyed my cabin. Hope to see you back in the future. A great place with all you’d need for a fun getaway! Thanks for the review. Really appreciated. This was our first trip to the Berkshires and we could NOT have picked a better area to stay. Sherwood Forest Lake District is a beautiful area with plenty to keep one occupied. This A-frame cabin is barebones, but it has everything one needs for a very comfortable stay (and being Zep-heads, we were pleasantly surprised to see LZ I in the CD collection!). Next time we go back, we'll definitely stay here again. Wonderful little get away in the woods. We were very happy with our stay. The A frame is small, but we stayed with another couple and it met our needs. The house is well equipped, with lots of towels, a great refrigerator and a functional kitchen. We loved the rustic neighborhood and the packed dirt roads were great for morning walks and bike riding. There is a small swimming beach about a five minute walk from the place. Very quiet neighborhood. Lots of firewood and fire starters around a fire pit made us really wish we hadn't already planned our evenings out. Enjoyed some nice time in the hammock. Communication with Donna (host) was excellent. We hope to return. Thank you for your kind words. Hope to see you back in the future.